Aelius, AD 136 to 138, Bronze Dupondius. 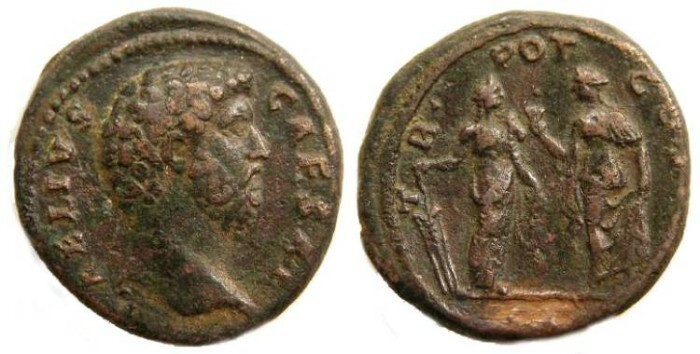 Denomination : There is dispute as to if these bare headed orichalcum coins are As or Dupondius, but as the metal is orichalcum and and the weight over 11 grams, I think there can be little doubt that these were intended to circulate as dupondius. It has been pointed out me that similar bare headed dupondius were issued for Domitian, Aelius and Marcus Aurelius, but only while they held the title of Caesar and not Augustus. As the crown was a sign of royalty (the ruler, or Augustus), it may have been considered inappropriate for a Caesar to be shown wearing one. Mint : Rome. Date : Issue of AD 137. Reference : RIC II, page 482, #1066 (under Hadrian). Sear-3992. Size : 26.0 x 27.4 mm. Weight : 15.15 grams. Grade : VF with a natural brown patination. The only major flaw being an area at the base of the reverse where the metal has been scraped down to the orichalchum. Obverse : Head of Aelius right, with L AELIUS CAESAR around. Reverse : Spes holding a flower and standing left, with Fortuna holding a rudder and standing right, facing each other, with TR POT COS II around, SC in the exurgue. A very attractive specimen other than for the scraped area at the bottom of the reverse.